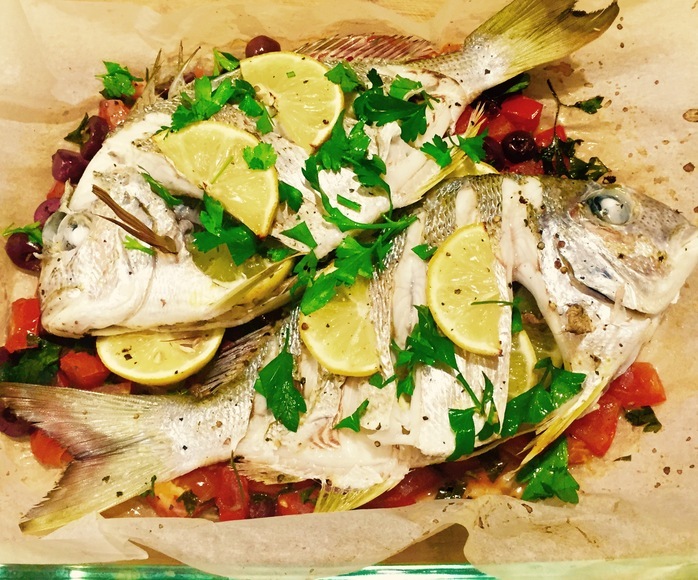 This easy, melt in your mouth fish is baked on a bed of delicious olives, tomato and parsley. The lemon garlic potato bites are a perfect zesty moorish side. 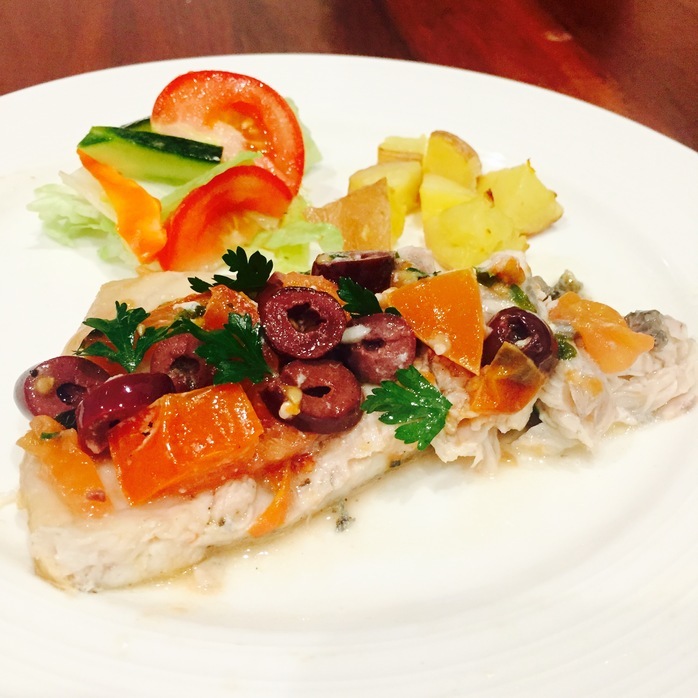 My family love this simple but flavoursome Mediterranean inspired dish. Preheat the oven to 220 degrees. Line two baking dishes with baking paper. Simmer the potatoes on medium heat for 6-7 minutes until soft, drain and pat dry. While the potatoes are simmering, place the tomatoes, olives, 1/2 cup of parsley, 2 slices of lemon in the baking dish. Season with salt and paper. Carefully make 5-6 cuts into each side of the fish to the bone. Insert 2-3 lemon slices and 1/8 cup parsley into each fish cavity. Place the fish onto the tomato and olive mixture. Brush the fish with the remaining oil, rub garlic into the cuts, place slices of lemon on the top and season with cracked pepper. Place the potatoes, zest and juice of 1 lemon, 1 clove of garlic, 1 tbsp oil, salt and pepper on a baking dish and toss to combine. Bake on the bottom wire rack in the oven. Bake the fish for 20-25 minutes on a wire rack above the potatoes until the fish is cooked through. Use a fork to lift the baked fish off the bone. 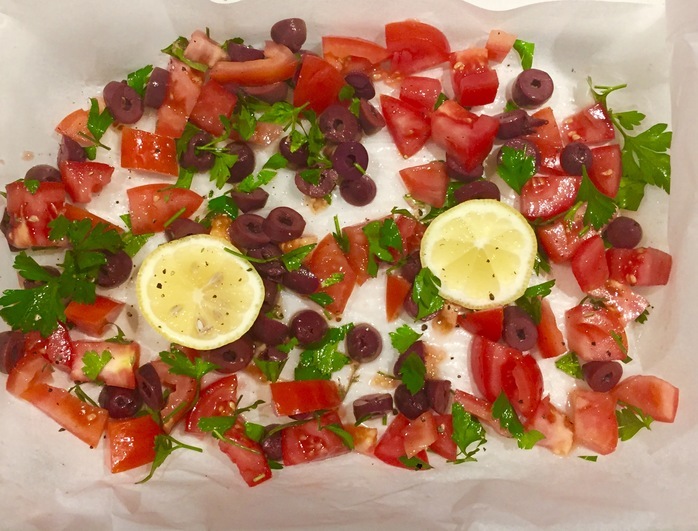 Spoon the baked olives and tomatoes over the fish and sprinkle fresh parsley on top. Serve with a side of garden salad and roasted lemon garlic potato bites. When cooked, the fish will be white and the pectoral fins will come off easily when gently pulled. The fish can be pan fried instead of baked for a crispy finish for 3-4 minutes each side.